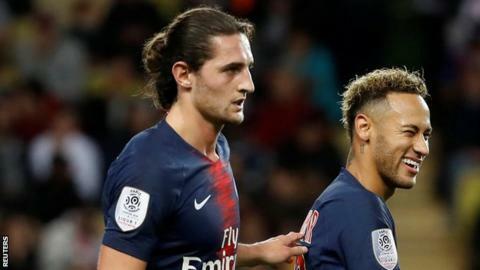 Barcelona have denied making an illegal approach for Paris St-Germain midfielder Adrien Rabiot - but are interested in signing the player. The 23-year-old is out of contract at the end of the season so can speak to other clubs when the transfer window opens on 1 January. According to reports, the Spanish club have already been in contact with the player via his representatives. But that would breach transfer rules so the club have issued a denial. A Barca statement insisted "there was no breach of regulations regarding the signing of PSG players". It added: "The only contacts were carried out last August and now a week ago. In both cases, the contacts took place with the sports managers of PSG. FC Barcelona always wanted to work from the highest level of transparency with PSG and with any other club." Rabiot has recently fallen out of favour at PSG with sporting director Antero Henrique telling Yahoo Sport France he would not play for the French champions again unless he signed a new contract.